Premise: The Busters Organization is a group of Specials who banded together to deal with problematic specials in their own way in hopes of changing the public opinion on them. However, their activity is increasingly becoming more dangerous as their popularity increased, drawing in unwanted foes. No More Heroes Anthology: An informative lore section regarding Specials and the world; it will include links to each chapter thread. Specials are human beings; despite having powers, bullets and such will still kill them. The story will not be on hold. So if you do not post within the week, we will skip you. Do not introduce outer-space elements or anything of the sort. Galactic Ruins has all that space magic. Do not metagame, powerplay, godmodding or bunnymodding. Expanding metagaming, do not mix your knowledge with IC (in character) with OOC (out-of-character information), your character(s) do not know everything. The maximum character limit is 3; you can choose to introduce a new one if one dies, but they cannot be used until the next chapter. Need help figuring out your power? Check the Power Wikia. Do not introduce your "new story" as an arc without approval. For three arcs, the villains will be maintain by me; players will have a chance to introduce their villain in the future. You can create up to three characters (max) throughout the duration of this roleplay. Death is possible in this story; however, if your character dies and you want to replace them with a new character, they will not appear until the next chapter. You have an option of making your character a villain. ONE of your registered character will be part of the Busters. You can only have ONE power for your character. Once a character went through approval in registration, you cannot create a character with the same power (including variations). Banned Powers: Magic/Magic Energy, Omnipotence, Omnipresence and Omniscience, Absolute Immortality, High-End Reality Warping, Instant-Death, Life-Drain (Death Version), Invincibility, High-End Intangibility, High-Level Space/Time Manipulation, Probability Manipulation, “Future Sight”, and Time Travel Manipulation. Identity Name: If one of the character is an entertainer or part of the Special Task Force, you can give them an identity name. Power: Imaginary: Anything Daiman imagines, it comes to life his hands. Weakness: If Daiman tried to boost himself up using his power, it would only last for a few minutes. It's also extremely exhausting for him to continue using the power in rapid succession. Appearance: Slim and often looking down. He has several wounds around his back and chest. Personality: He's quiet and soft-spoken. Lately, he's becoming more cynical ever thank the death of his cousin, Eon. Background: Daiman was born in California, living in a small town somewhere in San Bernardino county. He is the child of Zuleka and Edward. However, he barely sees them as the two are constantly working (although they do sent him gifts). He was under the care of his aunt for a while before he, along with Eon, decides to hit the street and become a professional hero. However, it backfired when he ended up being responsible of the robber's death. Power: Psychic/telekinetic powers. Your typical psychic user. Weakness: Her paranoia and inability to remain alone. If she remains alone for long periods of time, she begins to harm herself due to the voices in her head. She is very easily manipulated thanks to her fragile mind. Appearance: Straight, short black hair up to her shoulders, dark circles, and bags under her eyes from her lack of sleep. She's very short, barely measuring up to 5 feet. She has a dirty grey hoodie, black jeans, and black Converse Shoes. Under her jacket, her arms are full of self-inflicted scars and some scars are visible under her hair. Personality: Naolyn is a very nervous and paranoid Special who doesn't trust anyone around her because she believes that they will hurt her. She rarely sleeps because she is affected by nightmares and visions that torment her. Her body is always twitching in some way and she tends to say that 'The Voices' are trying to take control of her. She tends to unleash her powers violently when under stress or left alone for a long period of time. She appears child-like and scared of everything and everyone around her. Naolyn was born in Honduras but was brought to America at a young age. Her parents set high expectations for her at a young age before Naolyn was sent to the Rehabilitation Center when they found out she had powers. Once in the Center, Naolyn was discovered to be an insomniac (difficulty falling asleep or staying asleep, even when a person has the chance to do so.) From there, Naolyn was taken to the Medical center in their attempt to 'cure' her insomnia. They gave her medication (Most of which made her see things) and kept her away from all social interactions to monitor her sleep. 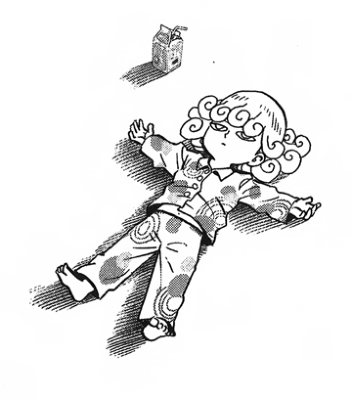 With the lack of sleep, she got stressed and lashed out using her psychic powers. She was then transferred to the Therapy Section where she remained most of her time in the Rehab. They usually kept Naolyn in complete isolation and extremely poor conditions to see how it affects her 'mind-like' powers and if it made them stronger or weaker. With all the medication and 'tests' they gave Naolyn, she eventually began to sink into paranoia. She started to hear voices and see visions that told her the 'future' and her body rarely ever sleeps. Whenever she does, she is often woken up by nightmares or visions. Because of this, her body is fragile and she tires easily. She does not trust anyone she meets but it was noted that when she finds a person (or people) she trusts, she becomes more stable and relaxed. While some say the intents of the medical and therapy group in the Rehab Center were to help Naolyn, many can argue they left her borderline insane. One report, in particular, says that Naolyn's powers reach full potential when her mind is experiencing heavy levels of stress such as pressure, hunger, and isolation, especially when separated from things or people she has grown close to. Power: Shadow Manipulation and control. His own Shadow can turn to almost any weapon. Weakness: The stronger the light is, the less he can manipulate shadows that are not his own. His eyes are also very sensitive to light. He can potentially be blinded if light flashes directly in his eyes. 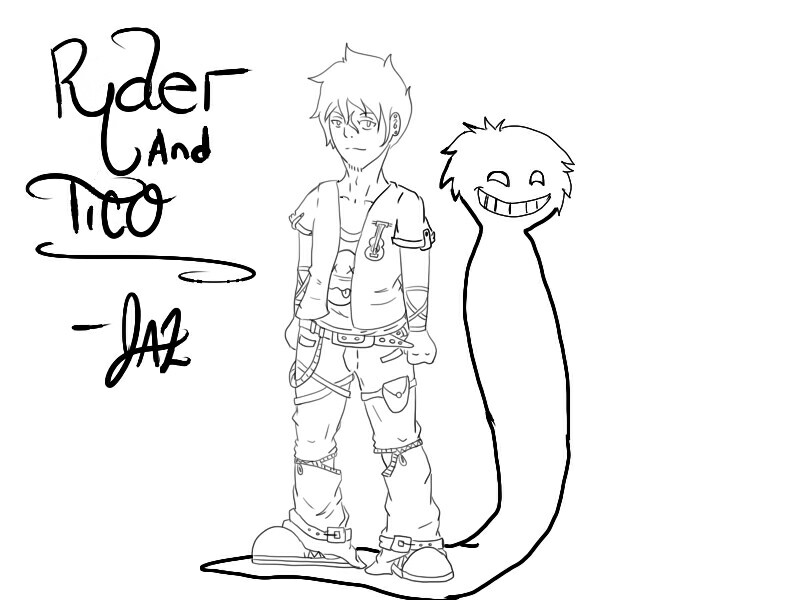 This is a very old drawing of Ryder. Some minor changes: Ryder's hair is a dark brown color. He wears solid black sunglasses, even in the dark. He carries with him a jet black guitar made entirely from his shadow. The color of his clothes is a mix of black, red, and blue. I kept the zipper-pants because it seems to be a staple with him. Personality: Ryder is very quiet and sometimes rude to people. He cares deeply for his music and hopes to become a rock star in the future and enter the hall of fame for rock stars. He's secretly very bashful about his music and tends to get embarrassed when people catch him singing a tune or rocking out on his guitar. He acts as if he doesn't want the compliments but secretly appreciates them. He is very nervous around women, particularly those that touch him and those taller than him. He prefers to stay as far away from them as possible. Ryder was born and raised in Nashville Tennessee. He was adopted at a very young age so he never got to know his parents. The family he grew up with were nice but distant with him. They knew he was a Special and feared him in a way. When Ryder discovered his powers of Shadow Manipulation, he started to become more rebellious. He still respected his parents and told them he will be as big as Elvis one day (They loved listening to the old Classics). Ryder graduated High School early for his age (He was actually a huge nerd) and eventually left home to find a career in the music field. He fell in love with a girl and moved in with her. He spent almost all the money he had to get a guitar and begin practicing his songs. When he got the courage to tell the girl he was a Special, she seemed to smile and accept him. She leads Ryder on, using him for money and telling him to use his powers to get more money and steal things. One day, when Ryder refused to use his powers for bad, the girl snapped and broke his guitar on his body, leaving a scar on his face right above his nose. She began to mess the place up and inflict wounds on herself before calling the police saying that she was being assaulted by a Special. When the police arrived, they believed the girl over Ryder because her 'wounds' were done only by a Special. Ryder was shortly arrested and eventually taken to the Rehab in Nowhere, Kansas. Weakness: Physical attacks that hit him directly will cancel his illusions. Appearance: ( Will provide Drawing in due time) 6'3, Dark-skinned, and very short hair. He doesn't wear a shirt and has several white traditional tattoos over his arms, chest, and back. He wears a couple traditional necklaces from his home, his favorite one being the necklace with the fangs and claws of a leopard. He has red pants that just barely go over his knees. He has a yellow piece of fabric that ties around his waist that looks to be burned on some parts. His legs also have similar white markings. He wears red high-top shoes. Personality: Zane is numb and emotionless to almost everyone around him. He is very quiet, intelligent, sadistic, and persistent. However, he isn't outright cruel or cold-blooded because all he seeks are answers to the confines of one's mind. His methods of finding answers usually cause more harm than good and are unethical, most of the times resulting in someone losing their mind, comatose, or death. He believes that fear and pain is what makes all living things stronger and, at the same time, hold them back. His ultimate goal is to have the world engulfed in his illusion powers so that those who are strong enough and smart enough to get past their fears and distinguish reality from illusion are the only ones worthy of being alive. Zane was born and raised in Kenya. He was the fourth born of seven children. He lived within a tribe that practiced hunting and hard work. He, along with his siblings, heard many stories from his father, telling of a day when this tribe will have birthed the 'Omen Child.' The Omen Child will deceive the eyes and minds of those around him using a force that mortals will not be able to understand. As Zane grew older, he noticed that he had powers and the village began treating him differently. He used his powers on his father as a joke, but since then, everything changed. One day, Zane's father hired someone to kill him because he was the 'Omen Child' he spoke of. Zane barely escaped with his life and fought back by trapping the killer in an illusion and forcing him to kill himself. His father sent more and more killers after his son, none able to kill him. Zane begged his father to stop but he refused, killing his siblings, tribe, then himself. His father said the rumors were true and the visions he had foretold him that Zane was the cause of this pain. The last words before death were: "I was scared of you... therefore I had to kill you to free myself of this horror." Zane left Kenya after 15 years and went to America where he studied hard and became a brilliant man. He earned several degrees and earned the title of Dr. Zane Issa. When he began to use his powers to exploit the pain and fears of innocent people, perform unethical experiments, and kill those 'not worthy', his license was revoked. Eventually, word spread of his powers and he went into hiding, performing experiments in the dark and discovering new things about fears and pain. Thanks to his constant exposure, he is not scared of anything and numb to all pain, almost lifeless. Weakness: her stamina becomes the equivalent of whatever animal she chooses to shift into and has seen the animal before well enough to mimic it. Fantasy or mythological beasts cannot be mimicked. Invertebrates not applicable. Appearance: Initially arrived to the center with long greyish-black hair that was evident it was well-maintained, but almost immediately, she chopped it all off to sit above the shoulders. She came with nothing but the designer clothes on her back, but lately it's switched to tank tops and shorts or baggy pants. Her eyes are gray. Personality: Chaotic neutral-- she follows her own moral code above all else. She is good at faking her emotions and uses this to her advantage in all kinds of situations. Her real self is bitter, cynical, with a jaded outlook on life although this began with the less savory aspects of the industry she worked in. Despite this, she's still got a heart of gold... somewhere. She speaks with a blunt and crass demeanor that betrays any nicer impression you would normally get from her. Celeste was a model that appeared in many alternative fashion magazines (all of which are found in trash cans and landfills following the wave of controversy that came out when it was discovered she was a Special) and even managed to land a few roles in some movies. The most recent one she filmed for was in theaters for a few days before she was bombarded with paparazzi in public who had been hounding her constantly since she started gaining popularity; unable to escape them, Celeste wished so badly to hide from them but couldn't do it on foot since she wasn't built for it. Suddenly she found herself nimbly dodging the people and into a place free of them, but realized she got away so quickly because she accidentally transformed into a coyote to run away. For several hours, she wasn't able to change back, instead shifting to different ones because she couldn't control it due to her panic. The entire fiasco ended with any movies she appeared in being pulled from theatres, magazines with her photo shoots thrown out en masse, and open scorn from people involved with pop culture. Although she was a pretty girl, she didn't exactly have a power that was considered attractive to match. She's only been in the Rehab Center for about two months but she would have been there much earlier if it weren't for the time it took for everything to slowly sever ties with her. Weakness: Fire or heat sources. Moisture in the air must be present. Otherwise, she must use the water in her body. Appearance: 5'3". White hair and dark brown (almost black) eyes. She has tanned skin and short messy hair (with uneven bangs) that ends above the base of her skull and two locks of hair that stay longer at the front. She also wears a blue apron-dress and white kneesocks, but these are obscured by the gray winter coat she wears that ends about halfway above the knee: she wears it to keep others from feeling the cold her body radiates. Personality: To people she doesn't know well, she is a mix of both withdrawn and bratty. In spite of placing strangers at arms-length, she acts benevolently if she doesn't feel threatened. Otherwise, she will stand her ground without resorting to lethal force (mainly out of fear she will do something she'll regret). As a friend/ally, she is kind, loyal, and playful even though she can still act a bit immature. Cernia is hard to genuinely anger, but actively tries to keep it in check fearing something bad will happen if she doesn't. Because of this, she is eager to please others and fears being socially rejected since she suffers from loneliness. Cernia's parents both died as casualties in an accident involving a rampaging Special when she was a small child, leaving her to be raised by her maternal aunt Eva while she repressed the memory almost completely. Even though she had a happy home with Eva after moving to the States, she never escaped being tormented at school for how she looked and behaved so unlike other children (staying in when it was hot out, parents never coming to school like the others, culture shock, etc). Cernia became close friends with three kids in middle school who taught her courage to stand up for herself more at the cost of ending up at the principal's office frequently because of the sheer volume of physical fights they would get into. Aunt Eva began to think of them as troublemakers, but they stayed friends until high school. Things died down for a while in terms of the bullying, but it took a turn for the worst when some of the school's bullies began to suspect Cernia was a Special rather than a sickly child. They conspired to separate her from her 'bodyguard' type friends as part of their plot to prove she was one by cornering her. After school, the gaggle of kids caught her behind one of the buildings that held her last class, backing her up against the brick wall to start their game with light hits and insults before escalating to fists being thrown because they wanted to 'force it' out of her. The teenagers eventually gave up and left her on the ground, no fun to be had since she wasn't fighting back. Cernia, still conscious, could hear the shouts of her friends out in the distance, see the backs of her attackers and was overcome with uncontrollable fury, wishing something horrible would befall them before she blacked out. When she woke up a few seconds layer, it turned out that several shards of ice sharp as glass had been lodged in the neck and on the backs of the teenagers. Cernia does not remember doing any of it, but apparently the ice had come from her hands and the building's water storage tank that was under maintenance. Her friends were mostly unharmed, except for one caught in the crossfire, and fled in a panic to call for an ambulance; 3 of the teens were fatally founded, including the friend, while the others had to remain hospitalized. Cernia also spent time having her injuries treated before being interrogated about what happened. Although it was considered an accident done in self-defense, the authorities confirmed she was a Special and a danger to others, calling for immediate export to the Rehabilitation Center. She goes to great lengths to make sure nobody knows about it because of the deep guilt she feels at the memory. Power: Blood bending to change the viscosity, elasticity, and hardness of her own blood by manipulating how it clots and solidifies. For a brief window of time that the blood is separate from her body, she can also manipulate it and attack without warning. Weakness: If she loses too much blood before she can clot it (such as expelling it from her body), she can become anemic and lose consciousness or die. Sound waves at certain frequencies will prevent her from clotting her blood and render her vulnerable to physical attacks. Also very vulnerable to blood thinners and other substances injected directly into her bloodstream as there is no way to prevent it from circulating to all of her body. Personality: Doesn't speak unless spoken to, usually staring out into space. It makes her a good listener though. She looks outwardly shy and is difficult to open up, but is very easy to tease and pick on because of how socially maladjusted she is. It's potentially dangerous since her mood swings between her usual withdrawn self to an irritable one that can easily attack you if you approach her too suddenly (before apologizing profusely). In a good mood, she's generally pleasant to have around since she likes being helpful where she can even though she isn't very expressive. After a particularly aggressive case of appendicitis in college, Marlene's strange blood ability was discovered during surgery. Clotting abnormalities occurred as her body pooled blood around the (ruptured) appendix and formed a relatively inflexible casing that kept her alive long enough for them to successfully remove it. 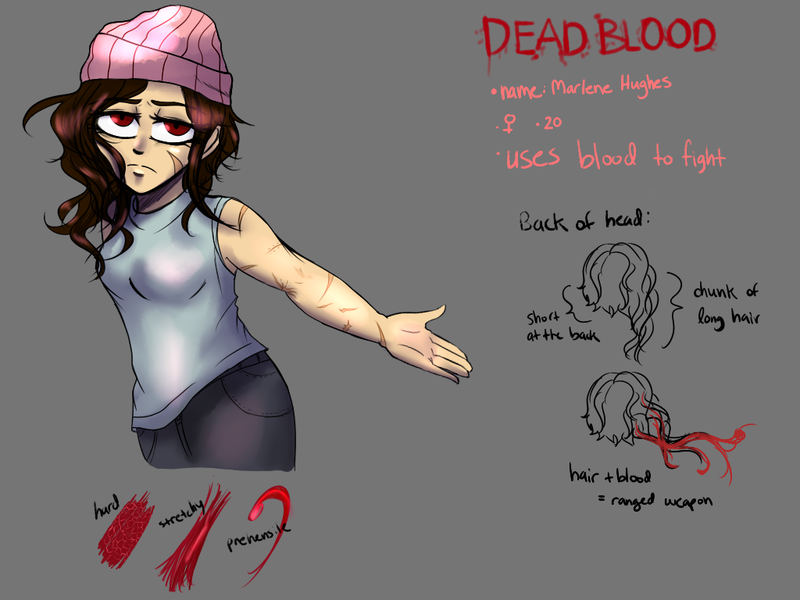 Scientists wanted to see it happen again, so some spontaneous tests were done to see how her blood would react; there was a time where she unintentionally hardened her blood to prevent a syringe from piercing her skin beyond the superficial layer since she hated needles. Under the guise that Marlene was living with a rare and unknown condition, the physicians recommended her family to let her be studied more extensively at the medical building of the Rehab Center for Specials; otherwise, her life expectancy would be "incredibly variant". It was a ruse since they knew she was a Special, but she lived for almost two years in a research wing of the medical building that exploited her powers to study them extensively to see how it could go toward treating diseases related to the human circulatory system. These procedures were incredibly painful and unethical, but she endured it hoping that one day they would allow her to leave if they used her power to cure people's blood diseases. This day never came, so as a result of bottling up her frustrations with the research, Marlene plotted to escape the facility by force if she had to. 5 personnel were reported to be injured (no fatalities) and she managed to escape, but didn't get far since she was caught and dragged back into the building (with an emphasis on non-lethal force since she was a valuable 'research specimen'). After deliberation however, the scientists ultimately decided not to keep her even with heavy containment because constantly injecting her with blood thinners would become a bothersome condition on its own that was more trouble than it was worth for any more findings. After a few more months of finishing up ongoing blood studies, they sent her on her way. Now she wanders around the center's buildings when she isn't obligated to attend rehab sessions. Weakness: the power of his barriers and weaponry varies according to light source; in effect, if there's little to no light in the area, he's essentially useless. Prolonged usage of this ability also causes exhaustion, as light can go on forever and can be a hazard if left unchecked. Also easily overwhelmed by any Darkness-related powers. Personality: VERY optimistic and cheerful, although a bit shy. Nix is also a pacifist, always preferring a nonviolent way in solving conflicts and only resorting to force when there are no other options available. The crux of his personality -- his entire principle -- is to always help and protect others. Fueled by his abilities to create barriers and also his medical background, Nix is always on the ready to be of aid to anyone needing it when the time comes. Nix is the eldest of three kids. Throughout much of his life he lived in relative peace with his dad, siblings and grandmother on their farm in northern Scotland, where he lived most of his childhood and teenage years in, before moving to Edinburgh to study medicine, hoping to be a cardiologist at one point in his life. Nix has always had his Special ability; he knows it, and because the farm is quite a ways away from the local village where no eyes would pry (and even if they did they kept quiet; his gramma is well-respected and very formidable), he's given the free reign to play around and refine his powers. On his fourth year, a civil war broke out between Scotland's government and Specials that were angry at the country's continued oppression on them. The destruction and lives lost during this bloody clash broke Nix's heart. On principle, he did not agree with what the Specials of Scotland were doing -- to him violence wasn't the answer, and only served to make Specials seem even more of a threat to Scotland. When the opportunity arose for more medics to help address casualties in the battle, Nix volunteered immediately, serving as a medic while also from time to time used his abilities to protect people and clinics by setting up light barriers to shield them from any attack from Specials. Although seen with suspicion initially, he and the Specials that also volunteered to help humans eventually were regarded as heroes. His act of valor and selflessness earned notice from an agent of the Busters Organization. When the civil war ended without any more violence, after the efforts by the group of Specials Nix was a part of together with Scotland's government, this agent approached Nix and asked if he'd be willing to join the Busters; they could use one with the skills and protective abilities as his. He could still complete his studies and come over once he's graduated, and may choose to continue studying in the US if he wanted to. Weakness: Water. Getting water on his body temporarily suppresses his ability to produces flames. Personality: Loner type attitude often trying to keep to himself. Quick to anger and always desires to prove himself. This pride can really blind him. Retreatist attitude and stubborness affects his relationships with people. Despite all this deep down he has a sense that things can be better and that he can be too. Background: Child of illegal immigrants who came to the United States due to an ongoing civil war in their home country. Gio was raised in Los Angeles and was quickly involved in gang life in his youth. Gio discovered his powers when he was involved in a brawl with a rival gang. His gang (MS-13) saw how they could overpower their rivals and used Gio as their weapon. Gio’s parents were disappointed their son had started becoming a felon. They cut ties with him and moved somewhere unknown leaving Gio behind. Heartbroken and alone, he learned his lesson and decided to quit the gang too. The gang could not force him to stay due to his strength and left him to live his life alone and on the run. Whereabouts: Captured when found committing a robbery, Gio was sent to the Special Rehabilitation Center to see if he would be able to change his ways. Weakness: High speed but low stamina similar to a cheetah. Going beyond max speed drains energy massively. Background: Youngest son of five of a wealthy business owner in Brazil. Parents seperated due to irreconciable differences but still receives family wealth due to his father feeling responsible. He was always told to be kind to anyone no matter what background since his father had come from a poor background. Raimundo discovered his powers early on when playing a soccer game as a child. He ran by te other kids with unimaginable speed. This surprised his father but this made him feel prouder for having a unique son. Rai soon became a recognized national treasure by the Brazilian government. Rai’s wish is that one day he can use his powers to help people. Whereabouts: Being an important philanthropist of Brazil and being the most beloved boy of the entire country, Rai's father was able to get him into the heroes program fulfilling Rai's dream of becoming superhero. Rai has been put to training where he follows along veteran heroes as a sidekick while he slowly transitions into becoming a solo hero. Weakness: Overcharge - Producing massive amounts of electricty causes strain to his body as well being unable to create more electricity temporarily. Personality: Mentally insane. Hurts other for pleasure and likes to treat these horrible acts as games. Intelligence is only at about a middle school level due to not being able to return to school. Desires to see others hurt for all the hurt caused to him. Reasoning is beyond him as his mental state has become simple and destructive. Background: Small town boy from Oklahoma. Was diagnosed with ADHD as a child but parents never did anything to do it about since they didn’t believe in mental illnesses or symptoms. His powers were discovered when his powers caused the town to lose power. Scrutinized by the other townsfolk, Jay’s parents isolated him from the world and abused him treating him as some sort of demon child. Years of isolation, depression, and hurt cause Jay to grow angry inside until one day he “overcharged” causing his brain to fry. His mental state started to slowly deteoriate turning him manic, obsessive, and emotionally unstable. His parents were suddenly without a trace and so was Jay. No bodies were ever found. Whereabouts: Currently held in the Special Rehabilitation Center's solitary confinement. He is monitored for long periods of time while being examined with extreme caution. Appearance: He is 6"0 with blond hair. Tends to be in a nice hoodie. Personality: Ray is quite smart and nice but he amoral. Background: Ray was razed by a underworld doctor that did teach him all he know of biochemistry and related topics. Ray did end up being a dealer and a doctor thanks to his powers. Ray was captured by the hero that he saved. He was given a choice rehabilitation or join the busters (Ray was given this choice despite being a criminal mostly because he saved or helped more than that one hero). He chose join the busters because he mostly because his life changes little form the roomers heard. After weeks of preparing for No More Heroes and reading the character registration thoroughly, here is a list of changes and recommendations needed before approval. If you have a character that does not fit the requirements listed in the template, then it will not be approved until it is met. Again, you can edit these profiles later once the story kicks in—but for now, basic information is needed. Celeste Castillo, Marlene Hughes and Cernia Nieves are approved. Change: Unless Cernia and Marlene is part of Heroes Program or Special Task Force, they have no need for identity names. Naolyn Mango and Zane Issa are approved. Addition: Ryder will not be approved until you have the basic information filled out. Once you do that, I'll approved it. Nix Kenric McKay are approved. Addition: Nix Kenric McKay needs a background information. Giovani “Gio” Rodriguez, Jay Lallana and Raimundo “Rai” Gaucho are approved. Change/Addition: If Raimundo is part of the Heroes Program, he needs an identity name. Furthermore, add the whereabouts of Giovanni (remember, at least one character will be included in the Busters Organization), along with Jay being included in the Special Rehabilitation Center. Ray "Doc" Wood are approved. Addition: Add information on his current whereabouts--either he's near the center or part of the Busters Organization. Okie dokie. I finished up Ryder's info so give it a check when you got time.